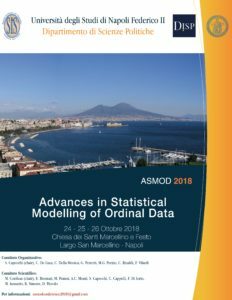 Ordinal data are ubiquitous in several scientific fields and an increasing amount of data is available to investigate perception and evaluation of many real problems. Thus, adequate modelling of ratings and preferences, judgements and opinions is a prominent issue in statistical research. After the successful experience of ASMOD2013, this Conference considers works from all scholars and academics on any topic related to ordinal data modelling and its applications. New approaches and innovative methods are especially welcome.